Cell culture is the process by which cells are grown under controlled conditions, generally outside their natural environment. After the cells of interest have been isolated from living tissue, they can subsequently be maintained under carefully controlled conditions. These conditions vary for each cell type, but generally consist of a suitable vessel with a substrate or medium that supplies the essential nutrients (amino acids, carbohydrates, vitamins, minerals), growth factors, hormones, and gases (CO2, O2), and regulates the physio-chemical environment (pH buffer, osmotic pressure, temperature). Most cells require a surface or an artificial substrate (adherent or monolayer culture) whereas others can be grown free floating in culture medium (suspension culture). The lifespan of most cells is genetically determined, but some cell culturing cells have been “transformed” into immortal cells which will reproduce indefinitely if the optimal conditions are provided. The 19th-century English physiologist Sydney Ringer developed salt solutions containing the chlorides of sodium, potassium, calcium and magnesium suitable for maintaining the beating of an isolated animal heart outside the body. In 1885, Wilhelm Roux removed a portion of the medullary plate of an embryonic chicken and maintained it in a warm saline solution for several days, establishing the principle of tissue culture. Ross Granville Harrison, working at Johns Hopkins Medical School and then at Yale University, published results of his experiments from 1907 to 1910, establishing the methodology of tissue culture. Cells can be isolated from tissues for ex vivo culture in several ways. Cells can be easily purified from blood; however, only the white cells are capable of growth in culture. 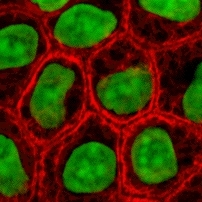 Cells can be isolated from solid tissues by digesting the extracellular matrix using enzymes such as collagenase, trypsin, or pronase, before agitating the tissue to release the cells into suspension. Alternatively, pieces of tissue can be placed in growth media, and the cells that grow out are available for culture. This method is known as explant culture. Cells are grown and maintained at an appropriate temperature and gas mixture (typically, 37 °C, 5% CO2 for mammalian cells) in a cell incubator. Culture conditions vary widely for each cell type, and variation of conditions for a particular cell type can result in different phenotypes. Balanced salt solution An isotonic mixture of ions to maintain optimum osmotic pressure within the cells and provide essential metal ions to act as cofactors for enzymatic reactions, cell adhesion etc. Phenol red dye pH indicator. The color of phenol red changes from orange/red at pH 7-7.4 to yellow at acidic (lower) pH and purple at basic (higher) pH. Cell line cross-contamination can be a problem for scientists working with cultured cells. Studies suggest anywhere from 15–20% of the time, cells used in experiments have been misidentified or contaminated with another cell line. Problems with cell line cross-contamination have even been detected in lines from the NCI-60 panel, which are used routinely for drug-screening studies. Major cell line repositories, including the American Type Culture Collection (ATCC), the European Collection of Cell Cultures (ECACC) and the German Collection of Microorganisms and Cell Cultures (DSMZ), have received cell line submissions from researchers that were misidentified by them. Such contamination poses a problem for the quality of research produced using cell culture lines, and the major repositories are now authenticating all cell line submissions. 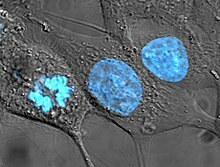 ATCC uses short tandem repeat (STR) DNA fingerprinting to authenticate its cell lines. Cell-to-cell contact can stimulate cell cycle arrest, causing cells to stop dividing, known as contact inhibition. Cell-to-cell contact can stimulate cellular differentiation. Genetic and epigenetic alterations, with a natural selection of the altered cells potentially leading to overgrowth of abnormal, culture-adapted cells with decreased differentiation and increased proliferative capacity. Among the common manipulations carried out on culture cells are media changes, passaging cells, and transfecting cells. These are generally performed using tissue culture methods that rely on aseptic technique. Aseptic technique aims to avoid contamination with bacteria, yeast, or other cell lines. Manipulations are typically carried out in a biosafety cabinet or laminar flow cabinet to exclude contaminating micro-organisms. Antibiotics (e.g. penicillin and streptomycin) and antifungals (e.g.amphotericin B) can also be added to the growth media. Another common method for manipulating cells involves the introduction of foreign DNA by transfection. This is often performed to cause cells to express a gene of interest. More recently, the transfection of RNAi constructs have been realized as a convenient mechanism for suppressing the expression of a particular gene/protein. DNA can also be inserted into cells using viruses, in methods referred to as transduction, infection or transformation. Viruses, as parasitic agents, are well suited to introducing DNA into cells, as this is a part of their normal course of reproduction. Mass culture of animal cell lines is fundamental to the manufacture of viral vaccines and other products of biotechnology. Culture of human stem cells is used to expand the number of cells and differentiate the cells into various somatic cell types for transplantation. Stem cell culture is also used to harvest the molecules and exosomes that the stem cells release for the purposes of therapeutic development. Cell culture is also a key technique for cellular agriculture, which aims to provide both new products and new ways of producing existing agricultural products like milk, (cultured) meat, fragrances, and rhino horn from cells and microorganisms. It is therefore considered one means of achieving animal-free agriculture. It is also a central tool for teaching cell biology. Cell culture in three dimensions has been touted as "Biology's New Dimension". At present, the practice of cell culture remains based on varying combinations of single or multiple cell structures in 2D. Currently, there is an increase in use of 3D cell cultures in research areas including drug discovery, cancer biology, regenerative medicine and basic life science research. 3D cell cultures can be grown using a scaffold or matrix, or in a scaffold-free manner. Scaffold based cultures utilize an acellular 3D matrix or a liquid matrix. Scaffold-free methods are normally generated in suspensions. There are a variety of platforms used to facilitate the growth of three-dimensional cellular structures including scaffold systems such as hydrogel matrices and solid scaffolds, and scaffold-free systems such as low-adhesion plates, nanoparticle facilitated magnetic levitation, and hanging drop plates. Eric Simon, in a 1988 NIH SBIR grant report, showed that electrospinning could be used to produced nano- and submicron-scale polystyrene and polycarbonate fibrous scaffolds specifically intended for use as in vitro cell substrates. This early use of electrospun fibrous lattices for cell culture and tissue engineering showed that various cell types including Human Foreskin Fibroblasts (HFF), transformed Human Carcinoma (HEp-2), and Mink Lung Epithelium (MLE) would adhere to and proliferate upon polycarbonate fibers. It was noted that, as opposed to the flattened morphology typically seen in 2D culture, cells grown on the electrospun fibers exhibited a more histotypic rounded 3-dimensional morphology generally observed in vivo. As the natural extracellular matrix (ECM) is important in the survival, proliferation, differentiation and migration of cells, different hydrogel culture matrices mimicking natural ECM structure are seen as potential approaches to in vivo –like cell culturing. Hydrogels are composed of interconnected pores with high water retention, which enables efficient transport of substances such as nutrients and gases. Several different types of hydrogels from natural and synthetic materials are available for 3D cell culture, including animal ECM extract hydrogels, protein hydrogels, peptide hydrogels, polymer hydrogels, and wood-based nanocellulose hydrogel. The 3D Cell Culturing by Magnetic Levitation method (MLM) is the application of growing 3D tissue by inducing cells treated with magnetic nanoparticle assemblies in spatially varying magnetic fields using neodymium magnetic drivers and promoting cell to cell interactions by levitating the cells up to the air/liquid interface of a standard petri dish. The magnetic nanoparticle assemblies consist of magnetic iron oxide nanoparticles, gold nanoparticles, and the polymer polylysine. 3D cell culturing is scalable, with the capability for culturing 500 cells to millions of cells or from single dish to high-throughput low volume systems. Besides the culture of well-established immortalised cell lines, cells from primary explants of a plethora of organisms can be cultured for a limited period of time before sensecence occurs (see Hayflick's limit). Cultured primary cells have been extensively used in research, as is the case of fish keratocytes in cell migration studies. ^ "Some landmarks in the development of tissue and cell culture". Retrieved 2006-04-19. ^ "Cell Culture". Retrieved 2006-04-19. ^ "Whonamedit - Ringer's solution". whonamedit.com. Retrieved 2014-06-09. ^ "Animals and alternatives in testing". Archived from the original on 2006-02-25. Retrieved 2006-04-19. ^ Schiff J (February 2002). "An unsung hero of medical research". Yale Alumni Magazine. Retrieved 2006-04-19. ^ Voigt N, Pearman CM, Dobrev D, Dibb KM (September 2015). "Methods for isolating atrial cells from large mammals and humans". Journal of Molecular and Cellular Cardiology. 86: 187–98. doi:10.1016/j.yjmcc.2015.07.006. PMID 26186893. ^ Louch WE, Sheehan KA, Wolska BM (September 2011). "Methods in cardiomyocyte isolation, culture, and gene transfer". Journal of Molecular and Cellular Cardiology. 51 (3): 288–98. doi:10.1016/j.yjmcc.2011.06.012. PMC 3164875. PMID 21723873. ^ "Post - Blog | Boval BioSolutions, LLC". bovalco.com. Retrieved 2014-12-02. ^ "LipiMAX purified lipoprotein solution from bovine serum". Selborne Biological Services. 2006. Retrieved 2010-02-02. ^ Portela VM, Zamberlam G, Price CA (April 2010). "Cell plating density alters the ratio of estrogenic to progestagenic enzyme gene expression in cultured granulosa cells". Fertility and Sterility. 93 (6): 2050–5. doi:10.1016/j.fertnstert.2009.01.151. PMID 19324349. ^ Neimark J (February 2015). "Line of attack". Science. 347 (6225): 938–40. doi:10.1126/science.347.6225.938. PMID 25722392. ^ Drexler HG, Dirks WG, MacLeod RA (October 1999). "False human hematopoietic cell lines: cross-contaminations and misinterpretations". Leukemia. 13 (10): 1601–7. doi:10.1038/sj/leu/2401510. PMID 10516762. ^ Drexler HG, MacLeod RA, Dirks WG (December 2001). "Cross-contamination: HS-Sultan is not a myeloma but a Burkitt lymphoma cell line". Blood. 98 (12): 3495–6. doi:10.1182/blood.V98.12.3495. PMID 11732505. ^ Cabrera CM, Cobo F, Nieto A, Cortés JL, Montes RM, Catalina P, Concha A (June 2006). "Identity tests: determination of cell line cross-contamination". Cytotechnology. 51 (2): 45–50. doi:10.1007/s10616-006-9013-8. PMC 3449683. PMID 19002894. ^ a b Chatterjee R (February 2007). "Cell biology. Cases of mistaken identity". Science. 315 (5814): 928–31. doi:10.1126/science.315.5814.928. PMID 17303729. ^ Liscovitch M, Ravid D (January 2007). "A case study in misidentification of cancer cell lines: MCF-7/AdrR cells (re-designated NCI/ADR-RES) are derived from OVCAR-8 human ovarian carcinoma cells". Cancer Letters. 245 (1–2): 350–2. doi:10.1016/j.canlet.2006.01.013. PMID 16504380. ^ MacLeod RA, Dirks WG, Matsuo Y, Kaufmann M, Milch H, Drexler HG (November 1999). "Widespread intraspecies cross-contamination of human tumor cell lines arising at source". International Journal of Cancer. 83 (4): 555–63. doi:10.1002/(SICI)1097-0215(19991112)83:4<555::AID-IJC19>3.0.CO;2-2. PMID 10508494. ^ Masters JR (April 2002). "HeLa cells 50 years on: the good, the bad and the ugly". Nature Reviews. Cancer. 2 (4): 315–9. doi:10.1038/nrc775. PMID 12001993. ^ a b Dunham J, Guthmiller P (2008). "Doing good science: Authenticating cell line identity" (PDF). Cell Notes. 22: 15–17. Archived from the original (PDF) on 2008-10-28. Retrieved 2008-10-28. ^ Nguyen HT, Geens M, Spits C (2012). "Genetic and epigenetic instability in human pluripotent stem cells". Human Reproduction Update. 19 (2): 187–205. doi:10.1093/humupd/dms048. PMID 23223511. ^ "Moore v. Regents of University of California (1990) 51 C3d 120". Online.ceb.com. Retrieved 2012-01-27. ^ Hayflick L (September 1998). "A brief history of the mortality and immortality of cultured cells". The Keio Journal of Medicine. 3. 47 (3): 174–82. doi:10.2302/kjm.47.174. PMID 9785764. ^ "Worthington tissue guide". Retrieved 2013-04-30. ^ Qian L, Saltzman WM (2004). "Improving the expansion and neuronal differentiation of mesenchymal stem cells through culture surface modification". Biomaterials. 25 (7–8): 1331–7. doi:10.1016/j.biomaterials.2003.08.013. PMID 14643607. ^ Maguire G (2016). "Therapeutics from Adult Stem Cells and the Hype Curve". ACS Medicinal Chemistry Letters. 7 (5): 441–3. doi:10.1021/acsmedchemlett.6b00125. PMC 4867479. PMID 27190588. ^ a b Prieto D, Aparicio G, Sotelo-Silveira JR (November 2017). "Cell migration analysis: A low-cost laboratory experiment for cell and developmental biology courses using keratocytes from fish scales". Biochemistry and Molecular Biology Education. 45 (6): 475–482. doi:10.1002/bmb.21071. PMID 28627731. ^ Discher DE, Janmey P, Wang YL (November 2005). "Tissue cells feel and respond to the stiffness of their substrate". Science. 310 (5751): 1139–43. CiteSeerX 10.1.1.318.690. doi:10.1126/science.1116995. PMID 16293750. ^ Gilbert PM, Havenstrite KL, Magnusson KE, Sacco A, Leonardi NA, Kraft P, Nguyen NK, Thrun S, Lutolf MP, Blau HM (August 2010). "Substrate elasticity regulates skeletal muscle stem cell self-renewal in culture". Science. 329 (5995): 1078–81. doi:10.1126/science.1191035. PMC 2929271. PMID 20647425. ^ Chowdhury F, Li Y, Poh YC, Yokohama-Tamaki T, Wang N, Tanaka TS (December 2010). Zhou Z, ed. "Soft substrates promote homogeneous self-renewal of embryonic stem cells via downregulating cell-matrix tractions". PLOS One. 5 (12): e15655. doi:10.1371/journal.pone.0015655. PMC 3001487. PMID 21179449. ^ Engler AJ, Sen S, Sweeney HL, Discher DE (August 2006). "Matrix elasticity directs stem cell lineage specification". Cell. 126 (4): 677–89. doi:10.1016/j.cell.2006.06.044. PMID 16923388. ^ Paszek MJ, Zahir N, Johnson KR, Lakins JN, Rozenberg GI, Gefen A, Reinhart-King CA, Margulies SS, Dembo M, Boettiger D, Hammer DA, Weaver VM (September 2005). "Tensional homeostasis and the malignant phenotype". Cancer Cell. 8 (3): 241–54. doi:10.1016/j.ccr.2005.08.010. PMID 16169468. ^ Levental KR, Yu H, Kass L, Lakins JN, Egeblad M, Erler JT, Fong SF, Csiszar K, Giaccia A, Weninger W, Yamauchi M, Gasser DL, Weaver VM (November 2009). "Matrix crosslinking forces tumor progression by enhancing integrin signaling". Cell. 139 (5): 891–906. doi:10.1016/j.cell.2009.10.027. PMC 2788004. PMID 19931152. ^ Tilghman RW, Cowan CR, Mih JD, Koryakina Y, Gioeli D, Slack-Davis JK, Blackman BR, Tschumperlin DJ, Parsons JT (September 2010). Hotchin NA, ed. "Matrix rigidity regulates cancer cell growth and cellular phenotype". PLOS One. 5 (9): e12905. doi:10.1371/journal.pone.0012905. PMC 2944843. PMID 20886123. ^ Liu F, Mih JD, Shea BS, Kho AT, Sharif AS, Tager AM, Tschumperlin DJ (August 2010). "Feedback amplification of fibrosis through matrix stiffening and COX-2 suppression". The Journal of Cell Biology. 190 (4): 693–706. doi:10.1083/jcb.201004082. PMC 2928007. PMID 20733059. ^ Wipff PJ, Rifkin DB, Meister JJ, Hinz B (December 2007). "Myofibroblast contraction activates latent TGF-beta1 from the extracellular matrix". The Journal of Cell Biology. 179 (6): 1311–23. doi:10.1083/jcb.200704042. PMC 2140013. PMID 18086923. ^ Georges PC, Hui JJ, Gombos Z, McCormick ME, Wang AY, Uemura M, Mick R, Janmey PA, Furth EE, Wells RG (December 2007). "Increased stiffness of the rat liver precedes matrix deposition: implications for fibrosis". American Journal of Physiology. Gastrointestinal and Liver Physiology. 293 (6): G1147–54. doi:10.1152/ajpgi.00032.2007. PMID 17932231. ^ Li L, Sharma N, Chippada U, Jiang X, Schloss R, Yarmush ML, Langrana NA (May 2008). "Functional modulation of ES-derived hepatocyte lineage cells via substrate compliance alteration". Annals of Biomedical Engineering. 36 (5): 865–76. doi:10.1007/s10439-008-9458-3. PMID 18266108. ^ Semler EJ, Lancin PA, Dasgupta A, Moghe PV (February 2005). "Engineering hepatocellular morphogenesis and function via ligand-presenting hydrogels with graded mechanical compliance". Biotechnology and Bioengineering. 89 (3): 296–307. doi:10.1002/bit.20328. PMID 15744840. ^ Friedland JC, Lee MH, Boettiger D (January 2009). "Mechanically activated integrin switch controls alpha5beta1 function". Science. 323 (5914): 642–4. doi:10.1126/science.1168441. PMID 19179533. ^ Chan CE, Odde DJ (December 2008). "Traction dynamics of filopodia on compliant substrates". Science. 322 (5908): 1687–91. doi:10.1126/science.1163595. PMID 19074349. ^ Dupont S, Morsut L, Aragona M, Enzo E, Giulitti S, Cordenonsi M, Zanconato F, Le Digabel J, Forcato M, Bicciato S, Elvassore N, Piccolo S (June 2011). "Role of YAP/TAZ in mechanotransduction". Nature. 474 (7350): 179–83. doi:10.1038/nature10137. PMID 21654799. ^ "drug discovery@nature.com". Nature.com. Retrieved 2013-03-26. ^ Duell BL, Cripps AW, Schembri MA, Ulett GC (2011). "Epithelial cell coculture models for studying infectious diseases: benefits and limitations". Journal of Biomedicine & Biotechnology. 2011: 1–9. doi:10.1155/2011/852419. PMC 3189631. PMID 22007147. ^ Barrila J, Radtke AL, Crabbé A, Sarker SF, Herbst-Kralovetz MM, Ott CM, Nickerson CA (November 2010). "Organotypic 3D cell culture models: using the rotating wall vessel to study host-pathogen interactions". Nature Reviews. Microbiology. 8 (11): 791–801. doi:10.1038/nrmicro2423. PMID 20948552. ^ Edmondson R, Broglie JJ, Adcock AF, Yang L (2014). "Three-dimensional cell culture systems and their applications in drug discovery and cell-based biosensors". Assay and Drug Development Technologies. 12 (4): 207–18. doi:10.1089/adt.2014.573. PMC 4026212. PMID 24831787. ^ Bhattacharya M, Malinen MM, Lauren P, Lou YR, Kuisma SW, Kanninen L, Lille M, Corlu A, GuGuen-Guillouzo C, Ikkala O, Laukkanen A, Urtti A, Yliperttula M (2012). "Nanofibrillar cellulose hydrogel promotes three-dimensional liver cell culture". Journal of Controlled Release. 164 (3): 291–8. doi:10.1016/j.jconrel.2012.06.039. PMID 22776290. ^ DeRosa MC, Monreal C, Schnitzer M, Walsh R, Sultan Y (February 2010). "Nanotechnology in fertilizers". Nature Nanotechnology. 5 (2): 91. doi:10.1038/nnano.2010.2. PMID 20130583. ^ Hsiao AY, Tung YC, Qu X, Patel LR, Pienta KJ, Takayama S (May 2012). "384 hanging drop arrays give excellent Z-factors and allow versatile formation of co-culture spheroids". Biotechnology and Bioengineering. 109 (5): 1293–304. doi:10.1002/bit.24399. PMC 3306496. PMID 22161651. ^ Simon EM (1988). "NIH Phase I Final Report: Fibrous Substrates for Cell Culture (R3RR03544A) (PDF Download Available)". ResearchGate. Retrieved 2017-05-22. ^ Tibbitt MW, Anseth KS (2009). "Hydrogels as extracellular matrix mimics for 3D cell culture". Biotechnology and Bioengineering. 103 (4): 655–63. doi:10.1002/bit.22361. PMC 2997742. PMID 19472329. ^ Reuters (2006-01-26). "Quickie Bird Flu Vaccine Created". Wired. Wired.com. Retrieved 2010-01-31. ^ Gao W, Soloff AC, Lu X, Montecalvo A, Nguyen DC, Matsuoka Y, Robbins PD, Swayne DE, Donis RO, Katz JM, Barratt-Boyes SM, Gambotto A (February 2006). "Protection of mice and poultry from lethal H5N1 avian influenza virus through adenovirus-based immunization". Journal of Virology. 80 (4): 1959–64. doi:10.1128/JVI.80.4.1959-1964.2006. PMC 1367171. PMID 16439551. ^ "NIAID Taps Chiron to Develop Vaccine Against H9N2 Avian Influenza". National Institute of Allergy and Infectious Diseases (NIAID). 2004-08-17. Retrieved 2010-01-31. ^ Rapanan JL, Cooper KE, Leyva KJ, Hull EE (August 2014). "Collective cell migration of primary zebrafish keratocytes". Experimental Cell Research. 326 (1): 155–65. doi:10.1016/j.yexcr.2014.06.011. PMID 24973510. ^ Lee J, Jacobson K (November 1997). "The composition and dynamics of cell-substratum adhesions in locomoting fish keratocytes". Journal of Cell Science. 110 ( Pt 22): 2833–44. PMID 9427291. ^ Hunt P, Robertson D, Weiss D, Rennick D, Lee F, Witte ON (March 1987). "A single bone marrow-derived stromal cell type supports the in vitro growth of early lymphoid and myeloid cells". Cell. 48 (6): 997–1007. doi:10.1016/0092-8674(87)90708-2. PMID 2435412. ^ van den Berg-Bakker CA, Hagemeijer A, Franken-Postma EM, Smit VT, Kuppen PJ, van Ravenswaay Claasen HH, Cornelisse CJ, Schrier PI (February 1993). "Establishment and characterization of 7 ovarian carcinoma cell lines and one granulosa tumor cell line: growth features and cytogenetics". International Journal of Cancer. 53 (4): 613–20. doi:10.1002/ijc.2910530415. PMID 8436435. ^ Lee YG, Korenchuk S, Lehr J, Whitney S, Vessela R, Pienta KJ (2001). "Establishment and characterization of a new human prostatic cancer cell line: DuCaP". In Vivo. 15 (2): 157–62. PMID 11317521. ^ Ou D, Mitchell LA, Décarie D, Tingle AJ, Nepom GT (March 1998). "Promiscuous T-cell recognition of a rubella capsid protein epitope restricted by DRB1*0403 and DRB1*0901 molecules sharing an HLA DR supertype". Human Immunology. 59 (3): 149–57. doi:10.1016/S0198-8859(98)00006-8. PMID 9548074. Pacey L, Stead S, Gleave J, Tomczyk K, Doering L (2006). "Neural Stem Cell Culture: Neurosphere generation, microscopical analysis and cryopreservation". Protocol Exchange. doi:10.1038/nprot.2006.215. Gilabert JA, Montalvo GB, Artalejo AR (2006). "Rat Chromaffin cells primary cultures: Standardization and quality assessment for single-cell assays". Protocol Exchange. doi:10.1038/nprot.2006.294. Losardo RJ, Cruz-Gutiérrez R, Prates JC, Moscovici M, Rodríguez-Torres A, Arteaga-Martinez M (2015). "Sergey Fedoroff: A Pioneer of the Neuronal Regeneration. Tribute from the Pan American Association of Anatomy". International Journal of Morphology. 33 (2): 794. doi:10.4067/S0717-95022015000200059. MacLeod RA, Dirks WG, Matsuo Y, Kaufmann M, Milch H, Drexler HG (November 1999). "Widespread intraspecies cross-contamination of human tumor cell lines arising at source". International Journal of Cancer. 83 (4): 555–63. doi:10.1002/(SICI)1097-0215(19991112)83:4<555::AID-IJC19>3.0.CO;2-2. PMID 10508494. Masters JR (April 2002). "HeLa cells 50 years on: the good, the bad and the ugly". Nature Reviews. Cancer. 2 (4): 315–9. doi:10.1038/nrc775. PMID 12001993. Witkowski JA (July 1983). "Experimental pathology and the origins of tissue culture: Leo Loeb's contribution". Medical History. 27 (3): 269–88. doi:10.1017/S0025727300042964. PMC 1139336. PMID 6353093.